If you are planning to put your house on the market this summer, it goes without saying that you are hoping to sell your home as quickly as possible and get your asking price. Set the stage for success with these tips for styling and upgrading your home, and see results — fast. Plant blooming flowers and fresh greenery. Mow the lawn, and reseed or add fresh sod as needed. Repaint or stain the porch floor as needed. 6. Style your dining room table. The dining room is often a blind spot in decorating the home. Between dinners, a large dining table can look bare and uninviting, so styling it up with visitors in mind can increase the appeal. An oversize arrangement can look too stiff and formal, so try lining up a series of smaller vessels down the center of the table instead. 7. Take a good look at your floors. At the bare minimum, give all floors a thorough cleaning (and steam clean carpets), but consider having wood floors refinished if they are in poor shape. If you don’t want to invest in refinishing floors, the strategic placement of area rugs can go a long way. 8. Rearrange your furniture. In the living room, symmetrical arrangements usually work well. Pull your furniture off the walls and use pairs (of sofas, chairs, lamps) to create an inviting conversation area. 9. Choose sophisticated neutral colors. Now is not the time to experiment with that “fun”-looking lime green. But that doesn’t mean you need to go all white, either. Rich mid-tone neutrals like mocha and “greige” create a sophisticated backdrop that makes everything look more pulled together. 10. Create a gender-neutral master bedroom. 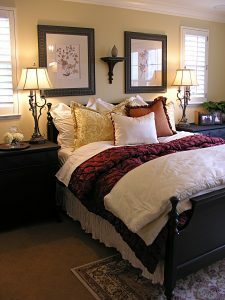 Appeal to everyone with a clean, tailored master bedroom, free of personal items and clutter. You can’t go wrong with clean, crisp linens, tasteful artwork and a blanket folded at the foot of the bed. 11. Open those closets! Open-house visitors will peek inside your closets. Closet space can be a make-it-or-break-it selling point for buyers, so show yours off to their full advantage by giving excess stuff the heave-ho. Again, this is really important, so even if you need to store a few boxes elsewhere, it’s worth it. Aim to have 20 to 30 percent open space in each closet to give the impression of spaciousness.